Thank You for your interest in participating in the 2019 Silverton Fine Arts Festival. 1. Review the Artist Prospectus below. 2. WORK SAMPLES: Please send four examples of your work via the "SEND FILE" link. 3. Complete all information on the form at the bottom and SUBMIT. 4. Go back to Silverton Fine Arts Festival and click on Artist Application Fee to submit $30 fee. Please note that submission of your application and payment of application fee do not guarantee selection into the 2019 Fine Arts Festival. Many thanks. We will get back to you shortly. You are invited to apply for acceptance to the 19th Annual Silverton Fine Arts Festival, to be held August 17 & 18, 2019 in Silverton, Oregon. Our goal for this festival is to celebrate the virtuoso talents of our finest local and regional artists, as well as to provide the public and our selected exhibitors with a show of the highest quality. The site, historic Coolidge-McClaine Park in the heart of Silverton, on the banks of Silver Creek, is a beautiful area surrounded by towering oak and Douglas-fir trees. It is a popular summer gathering place and a wonderful setting for the festival. Silverton area artists, art patrons, and community leaders involved in event planning are committed to providing pre-event and on-site service for all selected participants. We are further committed to quality marketing focused on art communities and major populations within a 50-mile radius (including Portland, Salem and Vancouver, WA). The Silverton Fine Arts Festival is within easy (and scenic) driving distance of Oregon’s metropolitan areas, and is adjacent to the Oregon Garden and Silver Falls State Park. Now in its thirteenth year, this show has established an excellent reputation for both quality of art and entertainment and hands-on activities for both children and adults, and encourages an atmosphere of conviviality between festival attendees and participating artists. To register online please fill out Application below, submit your $30.00 fee via PayPal and click the "SEND FILE" link to email us digital copies of your work. Please include 4 JPEG images of your art. Jurors select artists to participate based on slides submitted. Artists will submit four digital images (as instructed above). Jurors include individuals with experience as working artists, gallery owners, and festival directors. Jury selection is based on technical proficiency, individual style/personal vision and originality, as well as the spectrum of media represented in the festival as a whole. There is a non-refundable application fee of $30.00 to be included with the application. The festival is open to all artists and craftspeople producing original work. Artists collaborating on work should note so on the application. Two artists may share a booth if both are accepted by the jury. Both artists, however, must submit separate applications and fees. All artists must staff their booth for the duration of the festival. Art booth hours are Saturday from 10 am – 6 pm and Sunday from 10 am – 5 pm. Reproductions of original work, such as posters, and cards, may be sold, but may not occupy more than 15% of the total booth space. Commercially produced work from kits or imported art and goods may not be exhibited. Hand-pulled prints and photographs in signed and numbered limited editions will be accepted as original work under the appropriate category. Each exhibitor is provided a space that measures 10’x10’ (for a single booth), with a separation between booths. 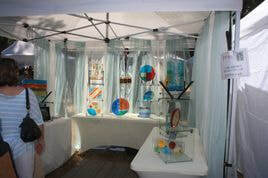 Artists must provide their own booths, racks and tables, in order to display their work in an outdoor environment. Booth spaces run along paved paths in the park, which is grassy and generally shady. Please leave your pets at home. As some booth locations are not level, exhibitors are advised to bring leveling devices as needed. There are a limited number of double booths available on a first come, first served basis. Booth fees are $225 for a 10’x10’ or $425 for a 10’x20’. No commission will be collected on sales. A welcoming reception with food and music for artists, sponsors, and staff will begin at 4:30 pm on Friday, August 16. Silverton Fine Arts Festival will make every attempt to safeguard the artists’ work and property, but liability is ultimately the responsibility of the artist. Overnight security will be provided. As a precaution, it is recommended that artists remove valuables each evening. Visit our website at FINE ARTS FESTIVAL page, call 503-873-2480 or email us. ​Click the link above to send us four examples of your work. You will be directed to your personal email account where you can attach and send files to us.